That Special Christmas Gift: It's the Thought that Counts! That Special Christmas Gift: It’s the Thought that Counts! Home » Blog » That Special Christmas Gift: It’s the Thought that Counts! Looking back through the years, I don’t remember everything I received, or even gave, at Christmas time. I’m sure my loved ones tried enthusiastically to present gifts that would bring joy to my heart, and I know I tried to do the same for others. There are a few really special Christmas gifts I remember receiving, however, and their memory warms my heart. I’ll bet if I’d trek through the boxes of keepsakes in the basement, I might even run on to a few of them! If you’ve been searching frantically through gift shops and specialty shops, fighting the frigid winter wind and the frustrated holiday crowds, desperately trying to find a special Christmas gift for that special loved one, look no further. It’s time to take off your coat and stay a while! All the special Christmas gift ideas you need are right here! Contrary to popular belief, children love meaningful gifts as much as anyone else. Although they may not get bragging rights for the coolest high-tech gift this year, they can certainly appreciate the most meaningful ones. 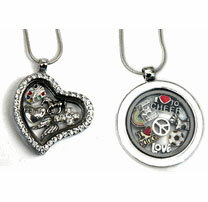 Charm necklaces are the perfect sentimental gift for that special girl in your life. The greatest thing about this type of gift, is that it can be completely personalized to portray all of the important things that are close to her heart. Frame it! Boys are sometimes a little bit harder to buy for when it comes to the sentimental side of things. One really creative idea that he is sure to love, however, is to present him with that something special in a frame or display! Maybe you’ve still got the keys to dad’s old hot rod? The lure he used to catch his first fish? Younger children love just about anything with their name on it! 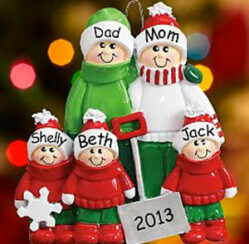 Purchase personalized dolls, stuffed animals, or blankets and watch their eyes light up when they see their own name lovingly displayed on their new gift. Women typically love anything of sentimental value. Bring tears to her eyes this Christmas with the most special Christmas gift she’s ever received! Custom jewelry like family birthstone rings, necklaces, or bracelets are sure to warm her heart as she thinks about the family members the stones represent. Personalized journals that include an engraving of her favorite inspirational quote will make her speechless. Have her favorite photographs custom framed to display her most treasured memories. Okay, I know what you’re thinking, just give him anything that makes noise or moves and he’ll be happy. Well I’m letting the secret out this Christmas- guys love meaningful gifts too! (just don’t tell his buddies) Make this a Christmas he will never forget with something that touches his heart! Have it engraved! Watches, golf clubs, and even tools are perfect for personalizing. Buy him a piece of land on the Moon! Give him your time! Schedule a night, or even a weekend for just the two of you. Purchase items that go with his collection, and when possible, have them personalized for a truly one of a kind gift. As we count down the days until Christmas, think about those you cherish, and present them with gifts that create memories that will warm their hearts for many Christmases to come!